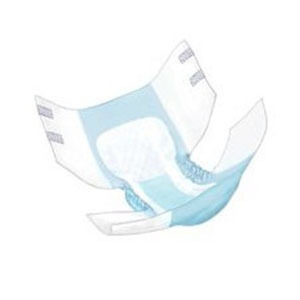 Wings Ultra Quilted adult diapers are disposable briefs for extra heavy incontinence protection. These adult diapers have sturdy refastenable tabs to ensure a secure fit and maximum protection. High density core specially formed for more protection where it is needed most. Super-absorbent core is designed to quickly lock in fluid and neutralize unpleasant odors. Cloth-like backsheet is ultrasonically bonded for a quilted look and feel, offering a noticeably quieter, discreet, and dignified solution. Airflow technology allows for air-to-skin contact, keeping the skin cool, dry and comfortable while minimizing heat buildup. State-of-the-art top sheet is noticeably softer than traditional non-wovens, providing a more comfortable experience for the wearer. Depend Protection Brief with Tabs Small/Medium 19" - 34"
TENA Bariatric Brief 3X-Large 64" - 95"